With eFotoGuide, you'll have all the key information you'll need to create stunning images in Arches, Big Bend and Zion National Parks. Whether you're looking to capture a unique photograph of an iconic location or get off the beaten track to shoot locations rarely ever photographed, eFotoGuide will get you there. Your eFotoGuide is delivered as a PDF document that you can view on virtually any electronic device - smartphone, computer or tablet - regardless of manufacturer. To make it as easy as possible to find locations to photograph in the best light, this guide is organized around the best time to photograph each location: morning, afternoon/evening and any time. Locations are presented one per page in an easy-to-read format that contains all the pertinent information you’ll need to make dynamic photographs. This way, no matter how many days you’ve got in the park, you can quickly identify locations to focus on. Find the locations that hold the greatest interest to you, learn what gear is most beneficial, even find a place to stay! 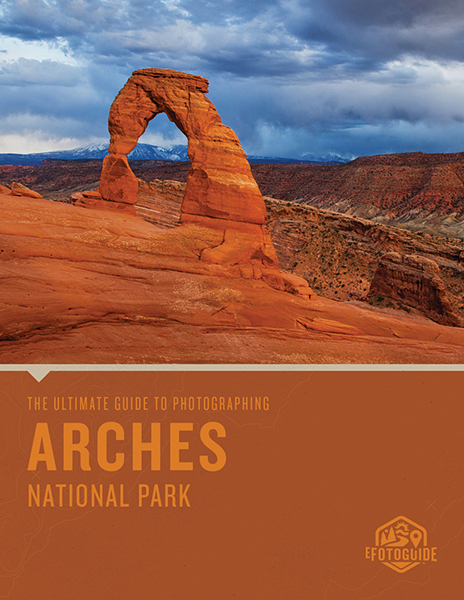 Buy the Arches National Park eFotoGuide™ today and study it before leaving home, so that when you get to the park, the only thing left to do is press the shutter button. Over. And over. And over again! One of Utah’s famous “Mighty Five”, Arches National Park is guaranteed to leave you speechless as you fill memory cards with stunning images of this landscape filled with vibrant red sandstone arches, hoodoos and towers. With eFotoGuide you’ll learn how, when and where to photograph over 20 spectacular locations in the park, as well as gain valuable information about the climate, desert safety and more to plan an incredible photo trip! 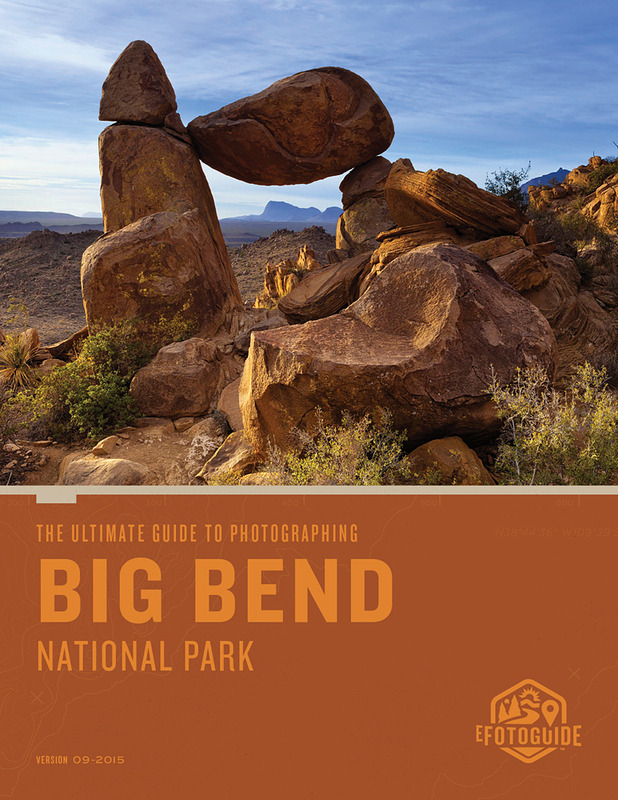 Big Bend National Park should be on every photographer’s bucket list. With canyons, balancing rocks, mountains and wildlife, not to mention an incomparable spring wildflower bloom, this park leaves nothing to be desired. With eFotoGuide you’ll learn how, when and where to photograph over 30 spectacular locations in the park, as well as gain valuable information about the climate, desert safety and more to plan an incredible photo trip! Another one of Utah’s “Mighty Five” Zion National Park attracts photographers from around the world who visit to photograph the notoriously colorful fall foliage, massive sandstone peaks, spooky slot canyons and plentiful wildlife. With eFotoGuide you’ll learn how, when and where to photograph over 20 spectacular locations in the park, as well as gain valuable information about the climate, desert safety and more to plan an incredible photo trip! Can’t decide whether to visit Arches, Big Bend or Zion on your photography trip? Visit all three and pick up the eFotoGuide Ultimate Bundle for less than you’d pay if you bought each ebook independently. What Do eFotoGuide Users Have to Say About Our eBooks? K. Schaeffer, New Mexico - Whether it's your first visit to Arches National Park or your tenth, I can highly recommend the eFotoguide: The Ultimate Guide to Photographing Arches National Park. I have it on my iPhone and have referred to it during several trips to Arches. It's accurate, concise, well done, and worth every penny.